I did not have bad poops! They just were interesting. For background, when Hazel was having issues with very stinky poops (VERY STINKY), I tried all kinds of things to keep the house from smelling bad. Even if I cleaned it up right away (using a gas mask! ), it took a while until the smell dissipated. I tried a few things and settled on a plug-in that wasn’t too strong. Scents aren’t good for cats and some cats react to them. Sprays land on their fur and they lick it. Not good. I used a plug-in that was a very mild vanilla. I used it in strategic hallways rather than places where the cats hung out. Mollie: I’m pretty good now. Just an occasional itch here or there. A while back (maybe a year or two), Mollie started scratching all the time. Behind the ears, on her belly, the back of the head, places she couldn’t reach. The vet thought food allergies. Diet changes didn’t help. I started to dose her with half of an allergy pill (for cats). It lessened the scratching but didn’t eliminate it. Recently the upstairs (where Mollie spends most of her time) plug-in was empty and I opted not to refill it. No one has stinky poops now and my three cats all cover the offending turds. Mollie’s scratching hasn’t stopped but decreased substantially. She may be allergic to odors or scents or chemicals rather than food. I use an electronic air cleaner with a UV light for odors in the basement near their litter boxes and that helps without making anyone itchy. Mollie did not like getting pilled so we are all happy campers here! Everyone here wishes you a great weekend. The cats are looking forward to the snowstorms predicted in the northeast. Their owner, not so much. I hear she is counting the days until spring. Morgan: Yes little grasshopper, we will get white stuff this weekend and all this will be covered. It makes the humans say bad words but look sad and maybe we’ll get treats! 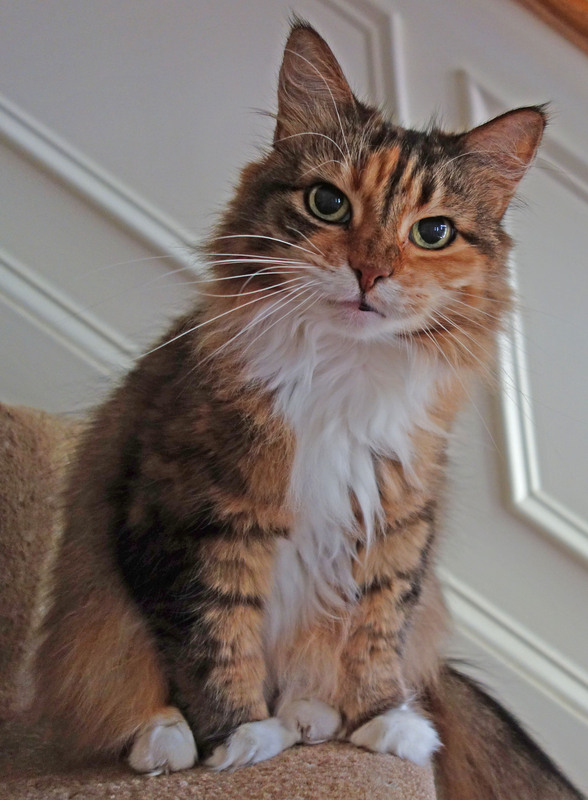 This entry was posted in For Animal Lovers Only, Humor, Sassy cats and tagged animals, cat allergies, cat pictures, cats, Gracie, Hazel, Mollie, Morgan, pets, plug-in scents, snowstorms by Kate Crimmins. Bookmark the permalink. Hope the storm isn’t too terrible!Good detective work on the scent thing. Hopefully discontinuing helps her (and you) out! Storm petered out (not complaining!) Cold snap still coming though. Gracie snuggled on my legs with a fleece blanket. Morgan was roasting by the fireplace and Molly was under another fleece. You’d think these cats had no fur at all. Allergies are often so hard to track down, and it sounds like you may have made some important connections that may help poor Mollie. I hope you’ve managed to have a good weekend indoors? I don’t blame you one bit for your hope that spring comes early. I’m sure you have lots of people hoping for the same thing…may it be so! Cat allergies are tricky. They can’t tell you how they feel. She is a doll but getting old. She’s 14 this year. Where did the time go? wow – she’s looking gorgeous for her age! Tyler was just started on an allergy pill for too long and too much sneezing. It helped. I’m glad it’s not something else but I know that now we will start the “what is he allergic to” elimination testing. I did the extra water on the heat registers and the lysine and extra vacuuming, all those things that helped with Trinity already. I can’t think of a thing we’ve changed other than his dry food to feed fewer peas. Tyler could care less about the weather, other than watching leaves blow around… it’s always 70 in his world. They have it good, don’t they? Good health care coverage, free food and great weather always. Glad Mollie is doing better! I never would have thought of plug in’s being a problem but it makes aense. We have the hot cocoa ready here as we wait for the snow to start. Cats (and dogs too) can be sensitive to things we don’t think about. It’s always hard to figure out what the offender is. The snow shouldn’t be too bad. Last I saw the storm was taking a more northern track so our total may drop as we get more rain (maybe), it’s that cold snap coming tomorrow I am not looking forward to. I think we are currently at 2 to 4 but I haven’t seen the weather forecast this morning. Nothing yet. It’s supposed to start in the afternoon here, guess we just wait and see! I am pretty sure the plug-in scents I had were not good for Z. I didn’t even think about them until they started bothering CH and me. So happy to hear that Mollie is doing better now that they are gone. No snow here, just a screaming Ibis…her name is Iris! Iris the Ibis! 🙂 I’d take her instead of snow. I’m not looking forward to the snow either – I wonder why I torture myself and hang on their every word too. I’d be happy if the snowstorm fizzled and missed us like last weekend – not a chance of that with every meteorologist in town hazarding a guess how many inches of snow we’ll get and when it begins and ends – sigh. They do get carried away. One said that these storms are what they live for. Must be boring in a place that’s always sunny and nice. Social media does laugh at The Weather Channel as they over-forecast and because they name their storms … there was a funny clip not long ago where a guy was trying hard to stand upright as the wind was so strong, and two guys walked behind him without any effort. Yes, it would be boring with beautiful weather, but look what we could enjoy and not be inside looking out with disdain. We have 19 degrees, a wind chill of -3 and we had 6 inches of snow which took all day to amount to that. It sounds like the end of the world out there right now with the gusty winds. First part of storm missed us. Very little snow. We’ll see with the winds and cold. Predicted for later today and overnight into tomorrow. Really brutal here from 6:00 to noon tomorrow – I went out to run the car in the garage and it just took my breath away … we get a few days respite and then back to the deep freeze again. Does your bubbler keep the pond from freezing even in this cold snap? I have both a bubbler and a small donut that warms a very small area. The bubbler does best as it keeps a larger area open even in this weather. You have to set it under the water so the surface ripples but there is no spray. One year I didn’t do that and I had ice sculptures from the wind and spray and I had to periodically dump hot water on them. That won’t happen again! It’s around 9 degrees and very windy here now at 9 a.m. I see – I have a friend who has a pond and he lives further north – I’ve just seen pictures, but never asked how they survive the Winter and he and his wife travel a lot, all year around, so I wondered how they get fed as well. I assume he has someone feeding the outside fish – he also has inside fish in large aquariums as well. He had them in Michigan, moved to Chicago for work for four or five years, returned to Michigan … the inside fish have survived all the moves successfully. It was brutal yesterday – and maybe -15 wind chill at times. We are above 0 now but the windchill is still just above zero. Today is the last day – this wintry mix we are getting overnight will make things icy and dicey. No walk for me for a little while – would not take a chance walking … I went to bed at 9:00 p.m. last night – the kitchen was very cold as I had the cupboard doors open to keep the sink pipes warm and despite getting insulation a few years ago, it was cold – my old laptop in my room is near the wall – I said “I’ll go to bed and try to warm up” … I’m a bundle of joy! You don’t have to feed outside fish. They eat algae in good weather but in the cold they hunker down at the bottom and have a sort of hibernation where their metabolism slows way down. That’s the beauty of an outdoor pond. A lot less worry. Yesterday was our really cold day. It’s already 17 here and tomorrow expected to be back to the 40s. Yay! I didn’t realize that Kate – no wonder Joe and his wife can leave and visit her parents in Florida several times during the Winter months. That is great – I thought you had to do a lot of preparation. We have a huge aquarium on Belle Isle in Detroit. They have Koi fish and every year they ask for volunteers and hand them buckets to get the Koi out of the ponds and into the inside aquarium – I associated the Koi with all pond fish and assumed you had to do something special for them. We have had freeing rain for a few hours – looked at the driveway and the snow is gone, but it’s like a skating rink out there. So grateful for working from home as they say it will linger til 8:00 a.m., then turn into rain and 41. I can remember going up the street in March when you get those ice storms … I had to get to the bus stop a few blocks away and took baby steps as I crossed people’s driveways, so afraid I’d wipe out. I heard that Starbucks is expanding their delivery to six more states … unfortunately PA is not one of them. Thought you had a plan for those bitter cold or icy days. You are partly right. Koi are much more touchy but my neighbor had them and he kept them in the pond over the winter. Perhaps in your area it’s safe to take them inside. Technically you can’t feed fish in the winter because of their slowed metabolism. They would get sick. That’s interesting Kate – I didn’t realize you couldn’t feed them. I should have associated it with the turtles at our Park creek that burrow into the bottom of the creek and are in a torpor state until it is warm enough to come back up into the water. I even discovered the turtle hatchlings would stay underground if the weather was not warm enough for them after hatching. We had an ugly weather day – I didn’t even go out to run the car. A lot of the snow melted but we plunge into the deep freeze again and more snow the beginning of next week. Winter is here to stay it appears. It’s in the 50s here today and pouring. Weather is bi-polar here. We had single digits earlier in the week. See we had that later yesterday, but only 41 degrees tops. This morning was great – I should have been on the ball more and I could have walked, but the early news/weather said “be careful as all the rain froze over and there are lots of slippery spots” so I told myself “you’ll run the car and come back inside” … when it was light I looked outside and no ice at all and the wind had dried everything up. I took the car for a nice long spin because our weather is bi-polar as well. Snowing now, big snow event Monday and worse cold than earlier this week. Agreed and the -30 degree windchill next week – ditto! When the grey kitten was diagnosed with asthma, the vet said no deodorizers at all. I’m not a big fan of them but have been known to have on on hand in case of emergency, ie unexpected guests. The biggest difference in him came when I switched to a dustless litter. I wish I had done it sooner in any case. It’s soooo much less dust in the house. Enjoy the snow. We are supposed to 2 to 4 inches and are acting like it will be the snowpocalypse. Cincinnati doesn’t enjoy snow. A lot of litters are marked low dust but I think they have dust. I also changed her litter upstairs to Arm and Hammer’s no stick clumping. It’s small particles but doesn’t seem to be more dusty than the larger particles one I used before. I hadn’t thought about it but that may have also contributed. Hazel’s poops were so stinky (and she didn’t cover) that I had to use something. The UV light filter has helped too. No scents at all. I’d never even considered that plug-ins might be problematic. But I don’t have to use them here, since I can almost always open a window without risking hypothermia. Of course my dog Fey is allergic to our orange tree, so I have other issues! Hmmm…citrus. We don’t have orange trees here. We took out the carpeting in the room Mollie hangs in last year and put in hard flooring. I thought that would make a big difference but it didn’t. Good luck with the upcoming (predicted) snowstorm, Kate. I’m counting the days until Spring as well. Can’t get here soon enough. Hope the weather cooperates to make you enjoy the weekend. Glad to hear Mollie is doing better. A cat shedding its fur can’t be fun. I worried that she would scratch herself open which would make her at risk of an abscess. I’m very glad they’re doing better. Chemicals can cause serious harm to animals and people–our cat used to have seizures due to the additives in the dry food, and when we switched to some without and additivies, he never had another episode and lived very long and well. It’s very hard to figure out what’s triggering these things. Hopefully we found at least one answer. Oh wow! Good info. I’m glad she’s better. Pear had bad allergies in California, but not in Arizona! I’m not telling Mollie that. She will want a vacation in Arizona! I’m not sure if there still is something else but it’s much better even without the allergy pills. She can come visit us! 🙂 That is strange about the pills. When we lived in California, one side of Pear’s body was hairless. She licked the fur off although we never saw her do it. Eventually we had to get her allergy testing and then shots. It never really worked, but when we moved to Arizona the fur grew back on her side. 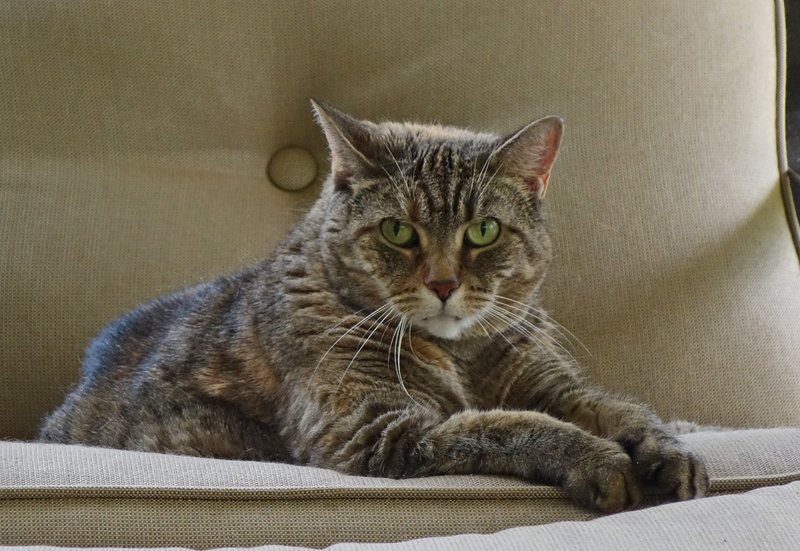 For a while Mollie would like all fur off of her hunches and belly. The vet thought it was stress but my house wasn’t stressful. It grew back and occasionally she will over lick a spot but not making it completely bare. It’s a mystery of life. Teddy has stinky poop. He poops at night when I am asleep so it doesn’t bother me and I clean it up first thing when I get up. He also had itchy skin but with the new diet he seems better. Love the pictures! The one of Mollie is adorable. Mollie is a beautiful 7 lb cat. Her weight is perfect for her build and except for the itchies she’s healthy at age 14. Mostly Hazel pooped overnight although occasionally she did it a little earlier. If I was watching TV I could smell it and it was in a room with a door (and catdoor) in the basement. That’s how potent it was. That is my snow fantasy. Sometimes I do it and sometimes I watch the weather channel like there was an apocalypse going on. With luck you’ve cleared the allergy producing stuff – so much to consider. Some of the candles, plug-in, and certain cleaners give me fits – I can’t image being so low to the ground and getting them stuck on me like a cat. We have air cleaners, too – but when RC Cat is having “issues” it can’t clean fast enough (gag). Still working on Mollie’s itches but it’s hard to tell. Don’t think they have allergy tests for cats. Some things like changing food, are not on her list of things to do. Sigh! Morgan just discovered treats. I never used them because of Hazel’s weight issues and I’d never something so tasty to one and deny another cat sitting next to her. That is a post all it’s own as she has learned to open doors. Could itches be from dry winter skin? Sigh…always something – and it’s always a mystery. Unlike humans who seem to think and learn less with age, cats apparently kick brains into gear and suddenly acquire all sorts of new skills… Cats opening doors – and deciding to take feeding themselves into their own paws is certainly a post all its’ own! Loved your last picture caption. I think cats (mine, too) actually think like that sometimes! No doubt about it. I’ve never done treats because Hazel was overweight. I could not give them to the other cats with her sitting there sad. Since she’s gone I gave some to Morgan and now that’s all she wants. I have opened a Pandora’s box. I don’t know what they put in those treats but it’s crack for cats. The fewer the toxins we bring into our homes, the better! Glad that Mollie is improving with the plug-in’s departure. It’s harder for animals. They are at ground level. Anything we bring in on our shoes, they walk in and eventually lick. I suspect lawn pesticides is one reason dogs get more cancer these days. Pesticide applications on lawns ~> NOT good for animals. Have a good weekend Kate. We got a dusting overnight and more is on the way over the weekend. 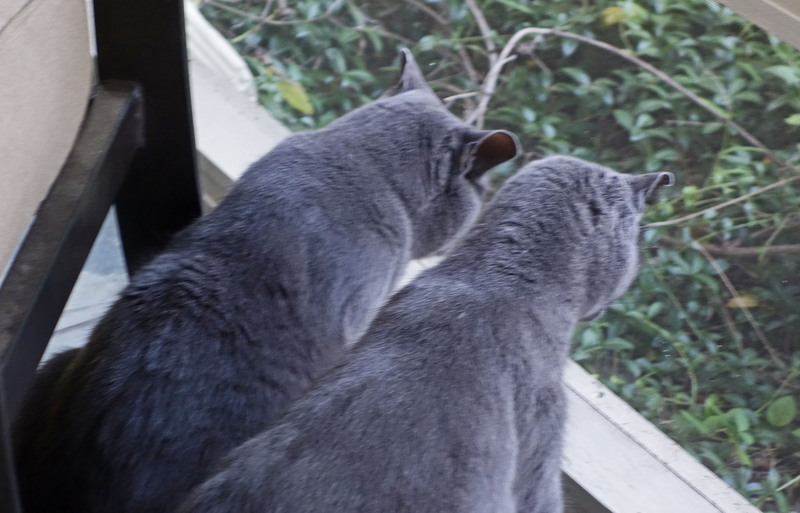 They are very interested in watching the birds scrap it away so they can find seeds. we had a few flurries yesterday and a heavy frost this morning. A cold spell is snapping its way towards us apparently. We are getting a bitter cold snap this weekend. It’s January. This time last year it was bitterly cold and we’d had more than three lots of snow. I hate the cold, though don’t normally feel it as much as Hubby does. From your blog your weather seems milder than ours. This weekend it’s supposed to be 4 degree F on Sunday night which I think is close to -10 Celsius. I know you get less snow but our coastline doesn’t get much snow either. I’m with Hubby. Not a fan of cold. It’s about 3 degrees C today, colder in the wind, so we’re glad of our yellows. I just hope we don’t get really bad weather nexy month as both of us have important hospital appointments involving overnight stays. Overnight stays? Wow! Good luck. An appointment with the breast clinic for me and one for Hubby for his GERD problems which is an overnighter for monitoring. That looks like being postponed now as my appointment has been changed and clashes with his. We got SURPRISE snow yesterday. It’s pretty, but I’m looking forward to spring. Glad Mollie is doing better! In my strange head, I use groundhog day (Feb. 2) as the first day of spring. It’s not warm and there are storms after that but in my head it’s so much better than March. Usually by that date, we have had the worst of the coldest weather. Amazing the things that can cause allergies. Hooray that Mollie is doing better. And snow…not happy about that this weekend. Gonna be a long one for pet sitters. Many years ago I was away for a really bad snowstorm. My pet sitter got her boyfriend with his truck to drive to my house to feed my cats. I lived in NJ then and she was a great sitter. This was back in the days of no cell phones or active internet. I had to hope for the best. I always had her leave enough dry food out just in case. Very happy campers unless there is a lot of snow! We can box some and send it to you!